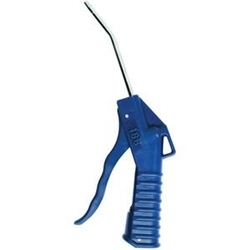 Milton Comfort Grip Blo-Gun, 4" Extension BOWES MIL S166. Comfort grip squeeze handle allows variable air volume. Built in hang-up hole allows for easy storage. Angled brass nozzle allows easy access to hard to reach areas.